This John Kessel (ends in 1 L, no initial) writes and edits science fiction. He lives and teaches in North Carolina. This is NOT the historian John L. Kessell (ends in LL, one initial), who writes about the presence of Spain in the American southwest. John Kessel discusses Wicked; Wizard of Oz. John Kessel's book The Baum Plan for Financial Independence and Other Stories was available from LibraryThing Early Reviewers. 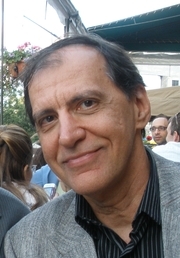 John Kessel is currently considered a "single author." If one or more works are by a distinct, homonymous authors, go ahead and split the author. John Kessel is composed of 4 names. You can examine and separate out names.